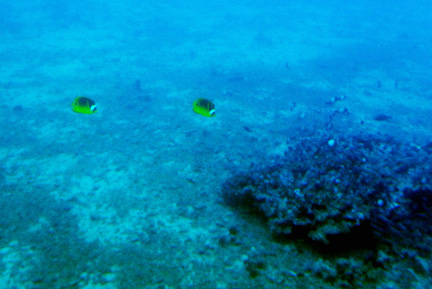 This continues the recap of my trip to paradise, aka Maui, Hawaii. 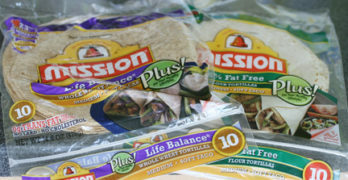 If you missed the first post, make sure you read part 1. In Part 1, we left off after day 4, where we had just come back from hiking through the rainforests of Maui. After a night of rest, we were ready to continue our adventures on the island. Friday morning was another early morning… as in 4:30AM before the crack of dawn early. We actually combined two adventures into one day. 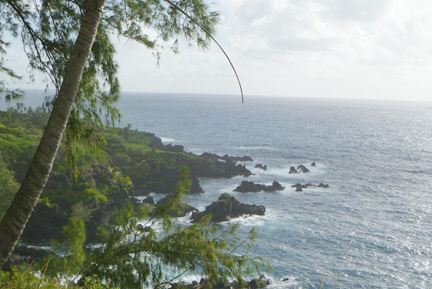 Taking our breakfast to go, we piled into the car and began the….duh.duh.duuuuuuh….Road to Hana! 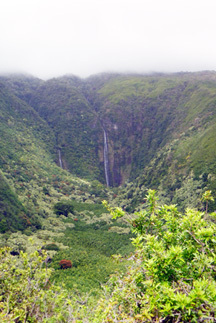 The road to Hana is a twisty and windy road that consists of 617 turns and 51 single-lane bridges in a 30 mile stretch. We were pressed for time so we didn’t have too many opportunities to stop and take pictures. But we were able to grab a couple of cool shot along the way. After about 4 hours of driving, and a few moments where I worried that we’d gotten lost, we entered Haleakala National Park. A few short miles after the seven sacred pools, we pulled into the parking lot of Maui Stables. The starting point for our next excursion. 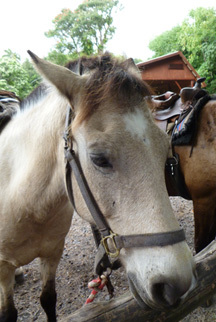 At the stables, we were each assigned horses (I got to ride a beautiful horse named Kona) and began our trek. A trek up the side of a volcano. I mean, who gets to do that sort of thing? We rode up, up, up the mountain for about an hour, with a genuine shaman giving us lessons on what we were seeing around us. 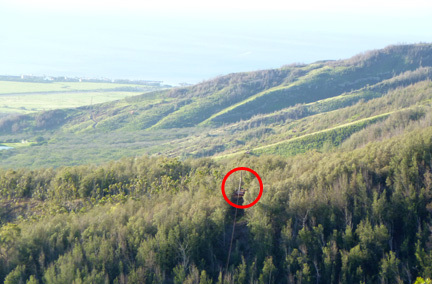 Did you know that Hawaii actually has wild cattle? They just roam around the state park, living off the land. At the top of our ride, we got to see a beautiful 300 foot waterfall and truly breath-taking views. After we got back to the stables, we had to figure out how to get back to our hotel. Option A: Go back the way we came. 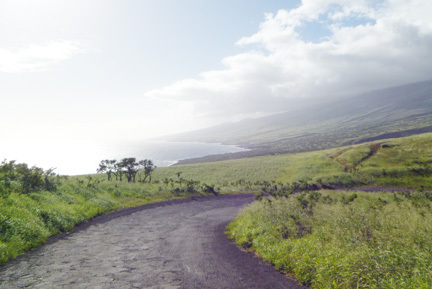 Option B: Drive the Hana Coast, of which 13 miles are literally ON the coast (as in feet from the water) and are unpaved. Of course, we chose Option B, and were well rewarded with views of the other side of the mountain. When all is said and done, I think we were in the car for at least 7, if not 8 hours and every moment was awesome! On the way home, we all picked up “I survived the Road to Hana” t-shirts. So day 5 was on a mountain and day 6 was under water. That means day 7 will be in the air! We woke up (early…again…of course) and headed to the base of the OTHER mountain on Hawaii. The one that isn’t Haleakala. From there, we took ATVs up the side of the mountain, just so we could zipline back down. Flyin Hawaiian Zipline has over 2 miles of ziplines down the mountains and let me tell you, ziplining is AMAZING. I had never been before, and it does take a huge amount of faith to take that first step off the platform, but once you do, you are FLYING through the air. And you get full, 360 degree views as you soar hundreds of feet above the ground. Here’s a shot of one of the platforms I would zipline to. See the ocean in the background? So pretty. And here’s a quick clip of me flying! Wheeeeeeeeeeeeeeeeeeeeeeeeeeeeeeeeeeeeeee! Days 8 & 9 are to be continued in Part 3! Great pictures. We go to Hawaii once or twice a year since we only have a 5 hour flight. Used to go to Maui but now to Hawaii instead. If you ever go to Hawaii (big island) the i have some great post on restaurant reviews etc.